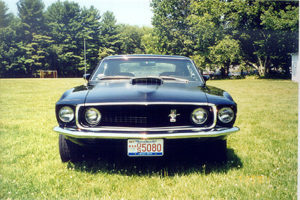 For a while, I went through a Mustang phase. 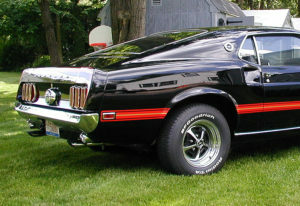 I’d always had a 1969 Mach 1 on my bucket list, from the time I first saw it on the sales brochure. 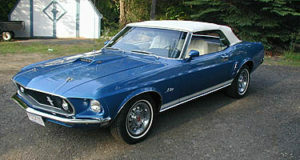 I also came close, as a working teenager, to being able to buy a brand-new 1969 Mustang convertible. The only thing that stopped me was that my father wouldn’t co-sign the loan since he already had his hands full, financially. So that went on the bucket list as well. 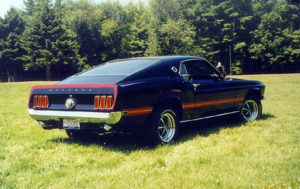 Mustangs have been a part of my life since I got my first one at 17, shortly after my first car was destroyed by a drunk driver. 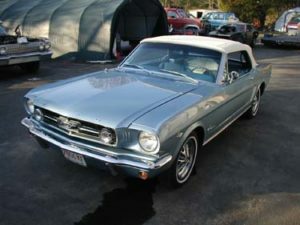 That 1965 Mustang convertible saw me through a good chunk of my Navy years and even got me from Connecticut to the Great Lakes Naval base in February 1972 through a blizzard that closed the New York State Thruway. I can still remember lying in the snow replacing the clutch after it failed and forced me to drive home 20 miles without a clutch at all. But I loved that car and every one that followed. 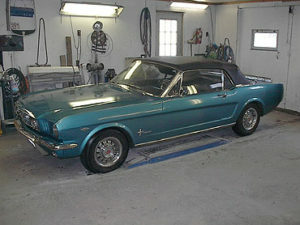 This is the Mustang that replaced the totalled 1965 Pontiac Tempest convertible. 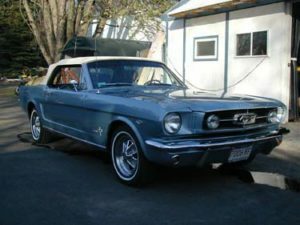 It was as basic as a Mustang convertible got, equipped with the 6-cylinder engine, a 3-speed manual transmission, and not much else. It served me well for several years, although it did need the odd repair now and again. 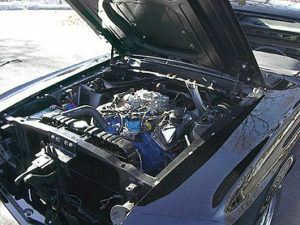 In fact, I replaced the clutch with the car parked as shown in the photo, lying in the snow to get the job done. 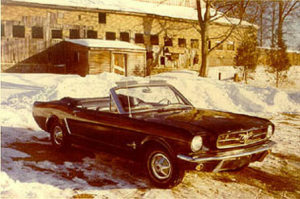 I drove it from the Waterbury, CT area to the Great Lakes Naval Station outside of Chicago on Presidents Day weekend in 1972, through a blizzard that closed the NY State Thruway. 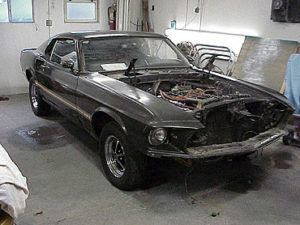 The Mustang handled it and kept going unitl I emerged from the back side of the storm somewhere in Indiana. 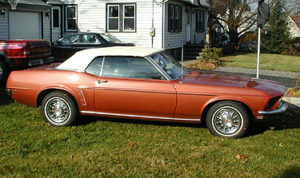 I eventually sold it to buy the 1968 Torino GT shown on the Everything Else page. 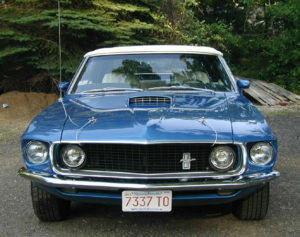 The restoration of this Mach 1 was done by Dave Croteau, owner and operator of D.C. Auto Restoration in Uxbridge, MA. 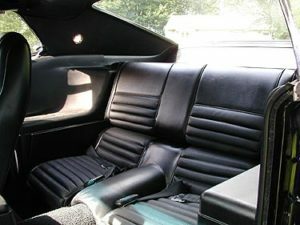 I bought this Mach 1 pretty much as you see it here from Signature Auto Collections in Columbus, OH. 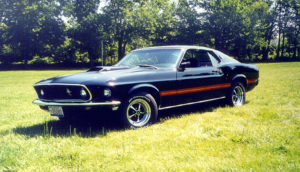 I’d always wanted a Mach 1 and finally found myself in a position to buy one. 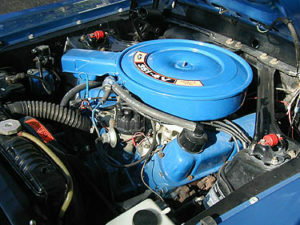 It doesn’t get much better than a 428CJ, 4-speed combination and that’s what this one possessed. The only downside was the Black Jade color. 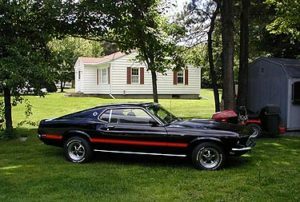 I decided that the color would be changed to Raven Black with red stripes. The results appear in the pictures below. 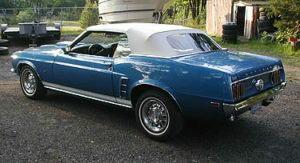 I purchased this Mustang from the daughter of the original owner in Houston, TX. 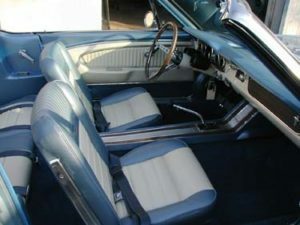 It was an umolested original car, but one that had little in the way of options other than the H-code 351-2V, power steering, power brakes, and A/C. An inspection showed it to be basically solid but needing rocker panel rust repair. 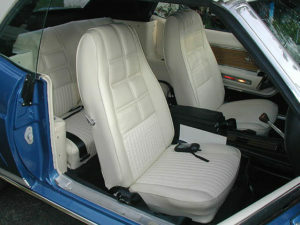 While considering what to do with it, I came across a picture of a 1969 Mustang GT convertible in Acapulco Blue, with a white interior and white top. I instantly knew that’s what I wanted this car to become. Along the way, we also converted the automatic transmission to a 5-speed Tremec TKO and upgraded the intake and carburetor to 4V. 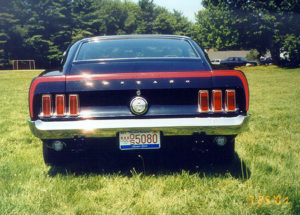 The restoration work on this Mustang was done by Dave Croteau, owner and operator of D.C. Auto Restoration in Uxbridge, MA. 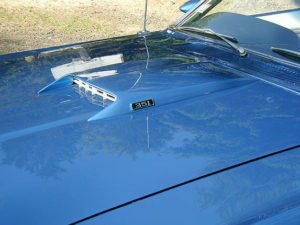 As can be seen from these web pages, I’ve had more than my share of fun cars. 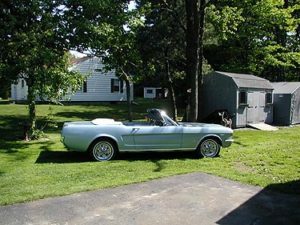 One car my wife has always wanted is a 1965 Mustang convertible. I spotted this one out in Western MA and went to look at it. It seemed to be in good shape and the seller was willing to let me drive it 90 minutes each way to have Dave Croteau look it over for me. The entire trip was done in pouring rain with no leaks and the car ran great. So a deal was done and this Mustang became a 25th wedding anniversary gift for my wife. 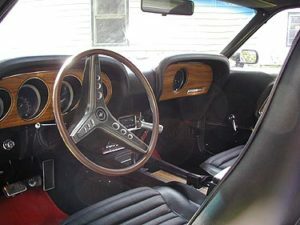 Between the VIN and other information that could be verified, we were able to determine that this Mustang had come from the factory with the 4-barrel 289 and a 3-speed manual transmission. Somewhere along the way, a previous owner had upgraded to a 4-speed. A power top was the only other option on the car. 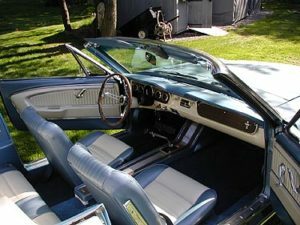 Next, Dave worked his magic on the restoration and Nancy got the car she’d always wanted in the colors and style she selected. 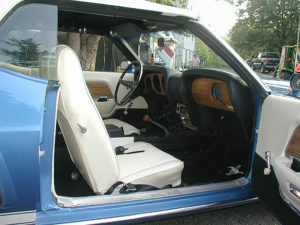 The result was this Silver Blue exterior and white convertible top over two-tone blue and parchment Pony interior.